A panini is a grilled-pressed sandwich using any variety of meats, cheeses, vegetables and sliced bread. The Onion & Garlic Soffritto FLAVOR BOMB works perfectly in any panini recipe. This recipe features grilled sausage, mozzarella cheese and roasted peppers. 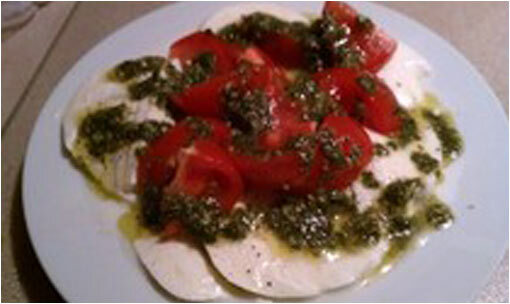 • All of the Pesto FLAVOR BOMBS work beautifully as a spread in a panini. Thin them out with Extra Virgin Olive Oil before using. • You can use Fontina, Gruyere, Cheddar, Swiss or your favorite cheese. • Try sliced steak with sauteed mushrooms and Fonitina cheese...delicious! Basil Pesto Flavor Bomb with Garlic & Extra Virgin Olive Oil﻿. Add One 8 oz. Bottle of Clam Juice﻿. Add Little Neck Clams, Cover and Simmer Until Clams Open﻿. Remove Clams. Saute Shrimp if Desired﻿. Add 1 Lb. Al Dente Linguine and Mix with Sauce﻿. For the quickest most delicious authentic Italian tomato sauce, add one Onion & Garlic and one Basil Pesto FLAVOR BOMB to a 28 ounce can of raw crushed tomatoes and a 15 ounce can of raw tomato sauce. 43 ounces total. Using a sauce pan, add some extra virgin olive oil and the canned, boxed or fresh tomatoes and bring to a simmer. Add the Onion & Garlic FLAVOR BOMB and let simmer for 30 to 45 minutes stirring occasionally. Add the Basil Pesto FLAVOR BOMB and stir into the sauce. Let the sauce simmer 15 more minutes. Salt & Pepper to taste. • If you are making a meat sauce, brown the meat in your sauce pan and then add the Onion & Garlic FLAVOR BOMB before you add the tomatoes. • Use this FLAVOR BOMB combination for Bolognese, Vodka, Zuppa De Pesce sauces. Use the Basil Pesto for White and Red Clam sauce. Marinate a protein, whether it’s poultry, pork, veal or beef in any one of the Pesto FLAVOR BOMBS thinned with at least ¼ cup extra virgin olive oil. Oven bake at 300 degrees for 20 to 30 minutes turning once. Remove from the oven and sear in a hot pan until lightly browned on both sides. (Don’t crowd the pan). Place on a serving platter and keep warm. Add a cup of broth or water to the pan, simmer and reduce it until it resembles a glaze , whisking up the color and bits from the searing. Taste for seasoning. You can add tomatoes, lemon juice, wine or soy sauce while it reduces. • Cutlets work well for this recipe. • Turkey broth works nicely with any of the above proteins. 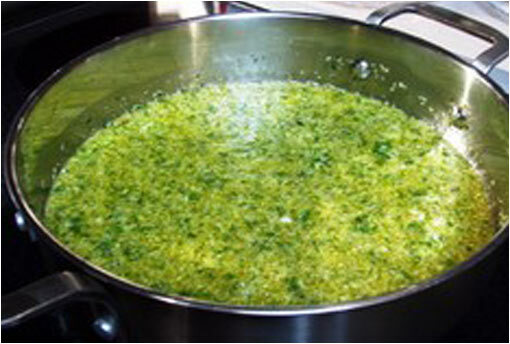 • Instead of using oil, you can turn your Pesto FLAVOR BOMB into herb butter by mixing it into softened butter. • Delicious! Let your imagination go. Slice fresh mozzarella and tomatoes and arrange on a platter. Use a Basil Pesto Flavor Bomb thinned with some extra virgin olive oil. Drizzle over mozzarella and tomatoes and serve.